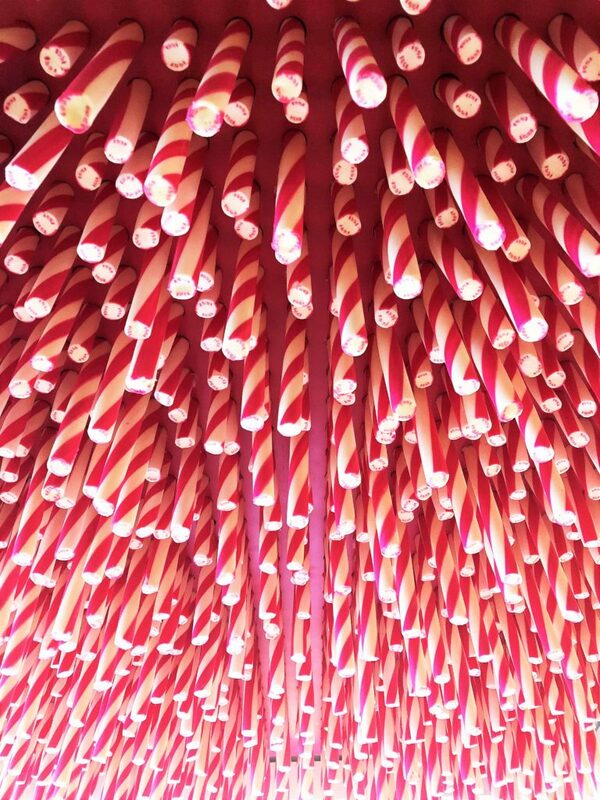 On Wednesday 8th November, I found myself gawping under a ceiling of 1000 suspended pieces of pink candy-striped rock. Yes, you read that right – a CEILING OF ROCK. The ultimate sweet-lovers fantasy which also made for an exciting textural treat. Coffee in one hand, croissant in the other (clearly I’m the only person who actually indulges in the complimentary breakfast) – I was in HEAVEN. I was standing in the fantasy-land of the lower ground-floor kitchen of 61, Holiday House in London. Holiday House is a design showcase like no other. 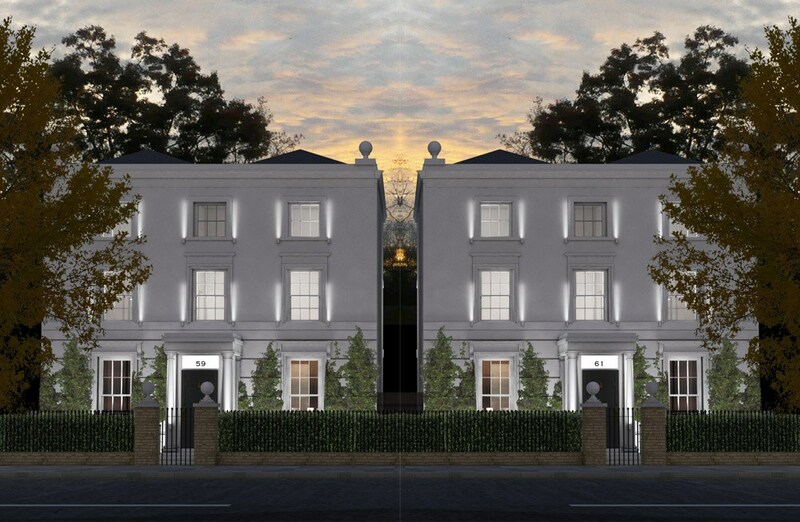 Two stunning show-houses – along the handsome Hamilton Terrace in the heart of NW8 – and all for a desperately important cause. 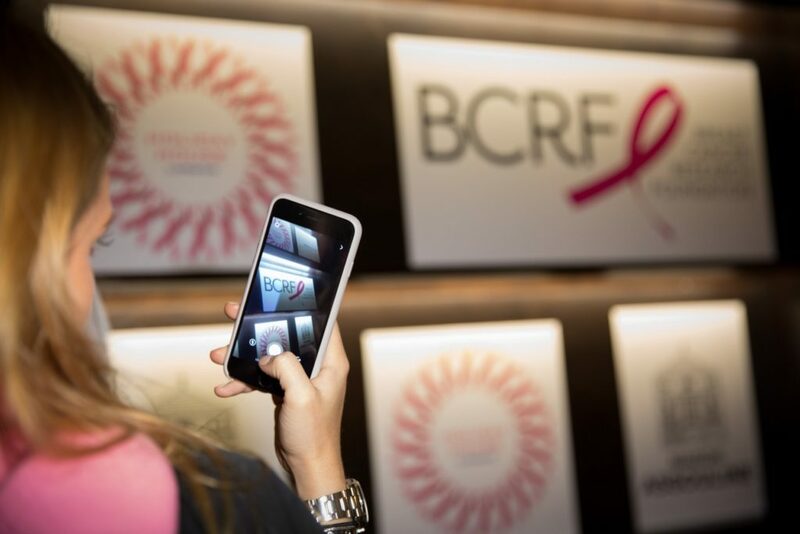 Bringing together extreme talent, from word-famous designers at the top of their game to exquisite brands, this extravaganza is all in the name of breast cancer prevention and cure. 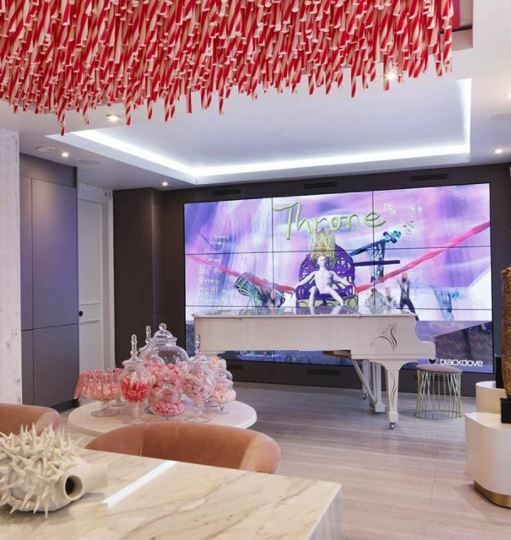 Raising critical funds for The Breast Cancer Research Foundation and the brainchild of breast cancer survivor, Iris Dankner, Holiday House London is a feast for all the senses. Who doesn’t love a show-house?! The opportunity to snoop and swoon at a gorgeously finished space where everything screams ‘luxe’. A world where your kids haven’t messed up the cushions, the food styling complements the scheme and the scent at every turning is ‘eau de fabulous’. Holiday House London is the ultimate show-house. In fact, this stunning exhibition offers up two immaculately designed and styled houses – with the biggest names in the business involved. Honestly, you’ll feel like you’ve just stepped into Pinterest perfection. Attending the press preview morning was fantastic because it allowed me the opportunity to talk to many of the designers and contributors first hand. And, as you may know, there is little I like more than talking interiors, design inspiration and understanding the insights behind creative minds. I had a really interesting chat with founder Iris Dankner, who was as welcoming as she is glamorous (and that’s very)! Beaming from ear to ear, she had every right to be proud of the work she and her dedicated team of co-chairs Joyce Misrahi, Rachel Laxer and Marketing Chair Grant Pierrus had achieved. Everyone was in total agreement – this was a spectacular accomplishment! Iris told me about her personal fight with breast cancer, discovering she had the disease after a routine mammogram 20 years earlier. ‘Early detection saved my life! After my surgeries and treatments, I vowed to do whatever I could to raise awareness and help women so that they would not have to go through what I did’. 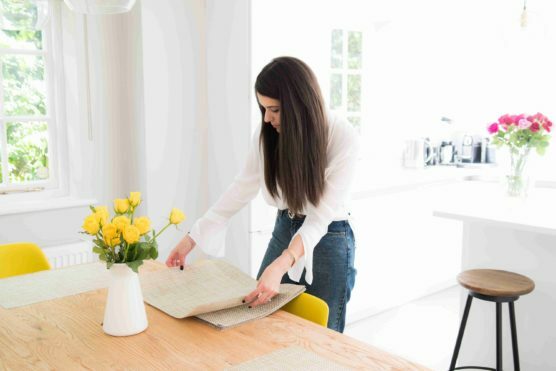 After ten years of fundraising for different cancer organisations, Iris realised that there were no events in the interior design industry that benefited any women’s issues and decided to combine her two passions – interior design and finding a cure for breast cancer – founding Holiday House. ‘My dream became a reality and has grown beyond my expectations’ – Iris’s passion for the project was electric. After 10 successful years in New York and the Hamptons, she was delighted to be celebrating Holiday House’s tenth anniversary in London. It was an early start but I was raring to go. I wore a red, appliquéd top for the occasion but on reflection, I should have worn pink. 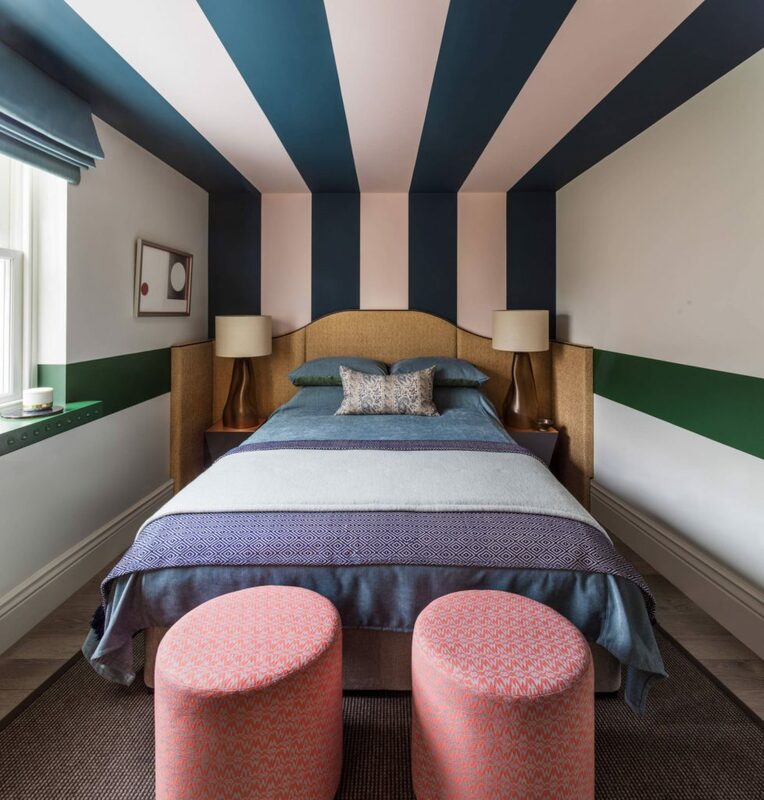 The colour synonymous with breast cancer research – we all know that ribbon – this was not a detail that Susan White, of Iggi Interior Design had overlooked. It was Susan who had create the suspended candy-striped rock ceiling at the entrance to her striking open plan kitchen space. ‘I didn’t want the motivation behind the project to be forgotten’, Susan White told me as we discussed her fabulous offering, ‘it’s the reason we’re all here today’. 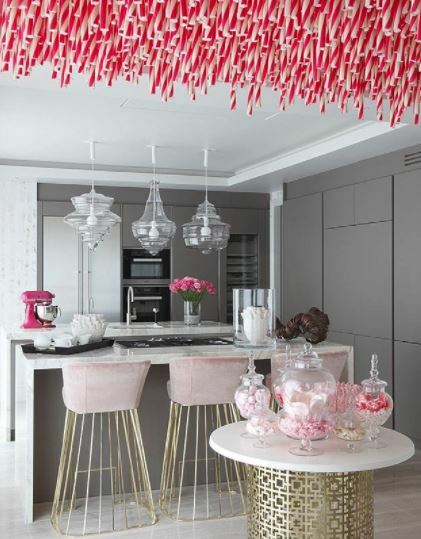 She told me that she had focused on colour to reinforce the message – from the rock on the ceiling to the pretty pink sweet-filled jar collection at the entrance and extending to the vibrant pink feather wall within the dining space. Susan and I discussed how interior design should be a total sensory experience. It was clear every aspect of her design had been carefully planned to achieve this; from the embellished white grand piano (that was being beautifully played) framed by a striking media feature wall featuring changing digital art to the highly tactile surfaces, scent of fresh flowers and sweet treats on offer. It was certainly a fun space to explore! Susan – a huge art enthusiast – had not only hung an array of exciting pieces on the walls but had even installed graphic canvases within the clear table-top. The statement media wall was certainly a fresh take on classic wallpaper – changing with the flick of a switch. 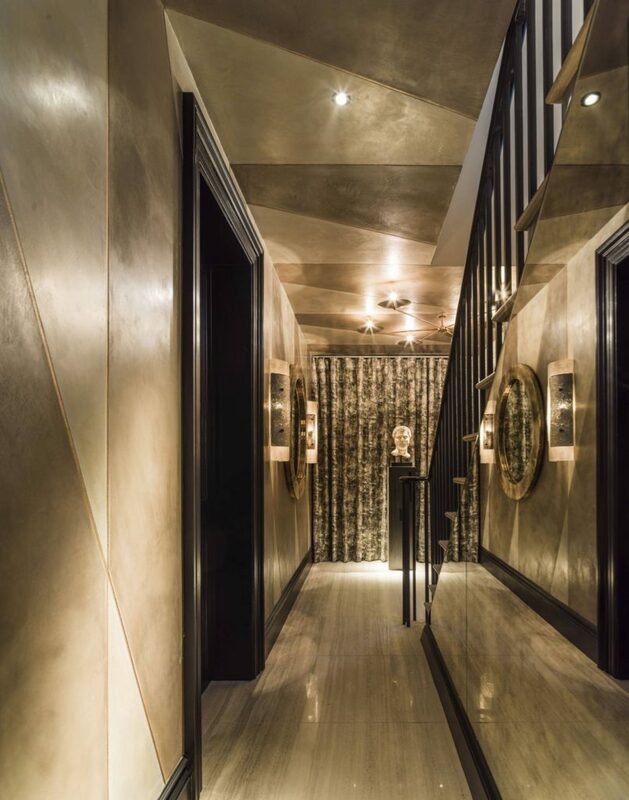 In the adjoining hallway, Jennifer Kraiem-Ghatan of JKG Interiors had devised a more paired-back, subtle experience through her ‘Echoes’ scheme. 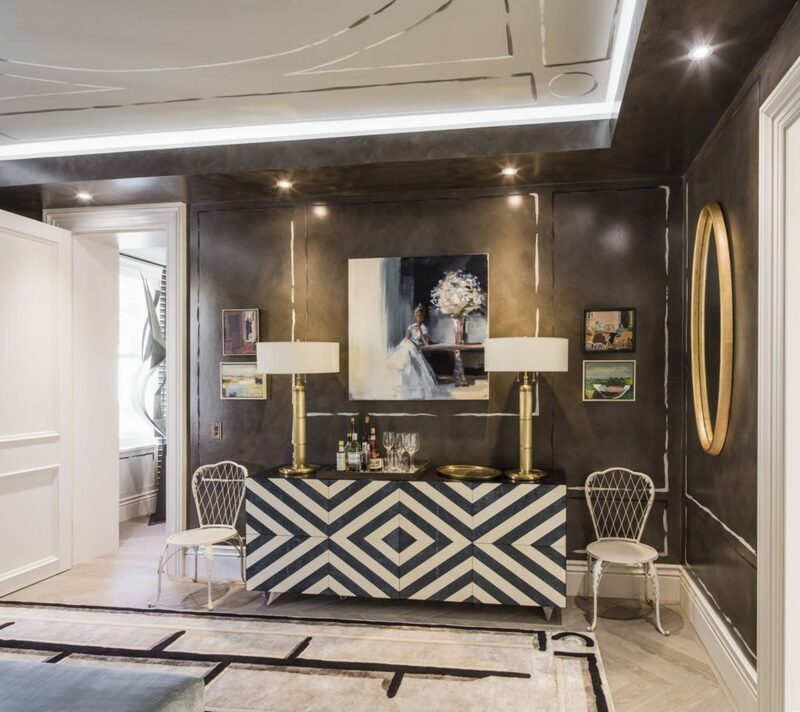 Awash with rich metallic textures and tones – from the brass inlay bespoke plaster panels to the sculptural mirror and lighting – she had created a calm, sophisticated retreat. Jennifer and I discussed how hallways and landings are often overlooked in the renovation of houses. They can be awkward areas to tackle but can really set the flavour for the spaces beyond. This landing certainly had some talking points and it mixed textures and tones beautifully. 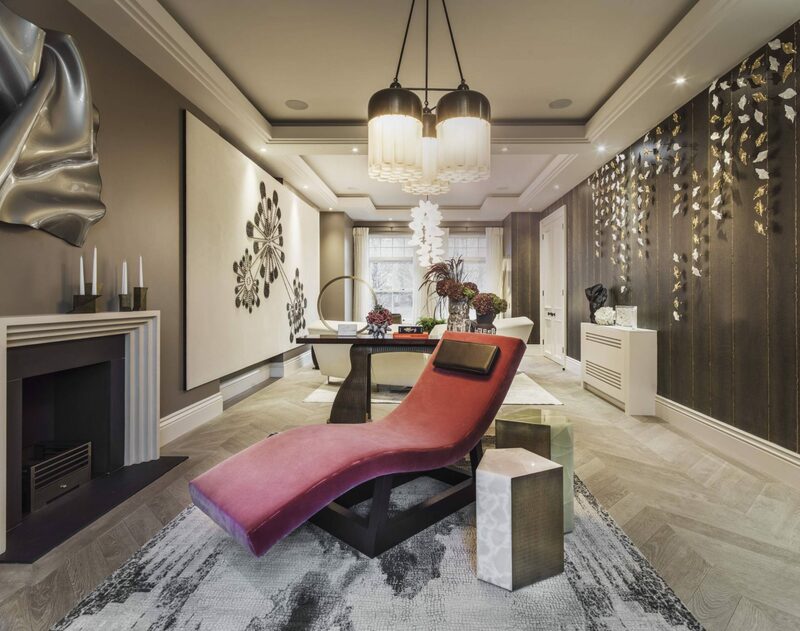 I marvelled over the striking Pythagoras sculpture, supplied by Hyde House Bespoke Furniture, the Charles Burnand London Spider ceiling pendant and fabulous Murano glass, patinated metal sconces. 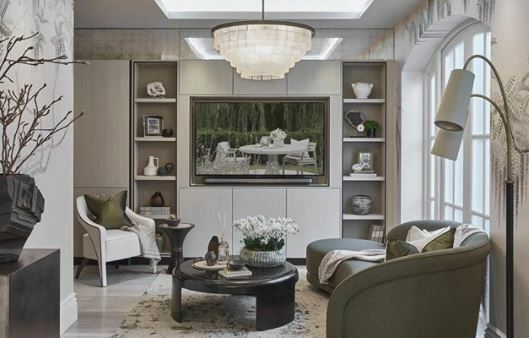 On the ground floor, Fiona Barratt Interiors‘s ‘Curated Design’ living room caught my eye immediately. A generous, light-filled space with a great sense of flow and an exquisite finish. 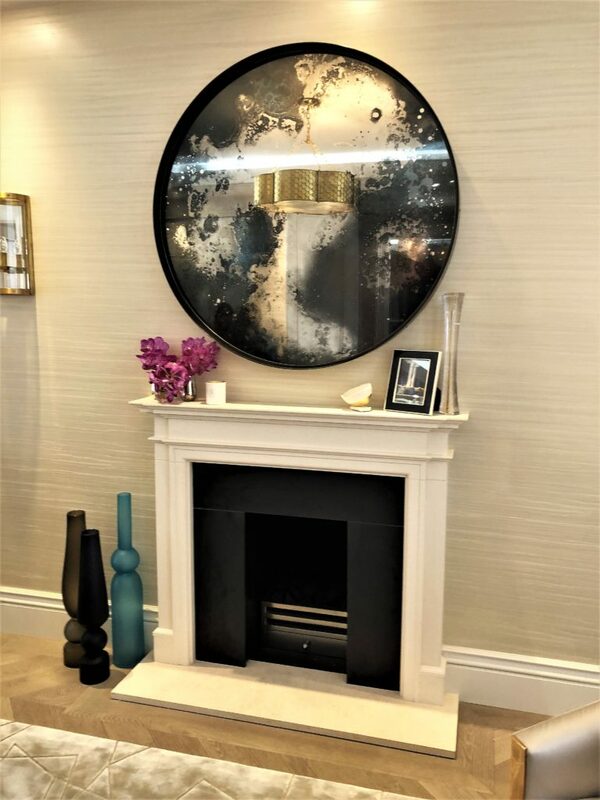 The sculptural light, curving downwards above the coffee table was a stunning focal point with its undulations emulated in the artwork on the wall behind. This was a scheme with space to breathe and fantastic flow. It allowed visitors the opportunity to step back and admire all the wonderful pieces within it. Every vista was curated to perfection. 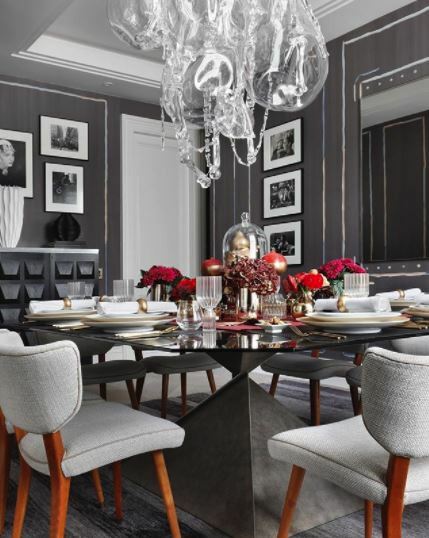 Opposite, the striking dining room was designed by Rachel Laxer, the talented owner of Rachel Laxer Interiors. With a darker, moodier flavour than its ground floor counterparts, the central focal point was a glamorously-dressed festive table. This was rich and layered, pairing rich berry shades with striking gold. (More on gold accents here). Centrally installed, the Tom Faulkner dining table was a hero-piece. Glass topped and finished with a heavy, pyramidal base, this grounded the scheme. Above, the statement chandelier from Lasvit, which features glass bones and skull detailing, was the ultimate ‘memento mori’. The sense of mortality was extended to the black and white vintage photographs which flanked a large central mirror on the back wall. 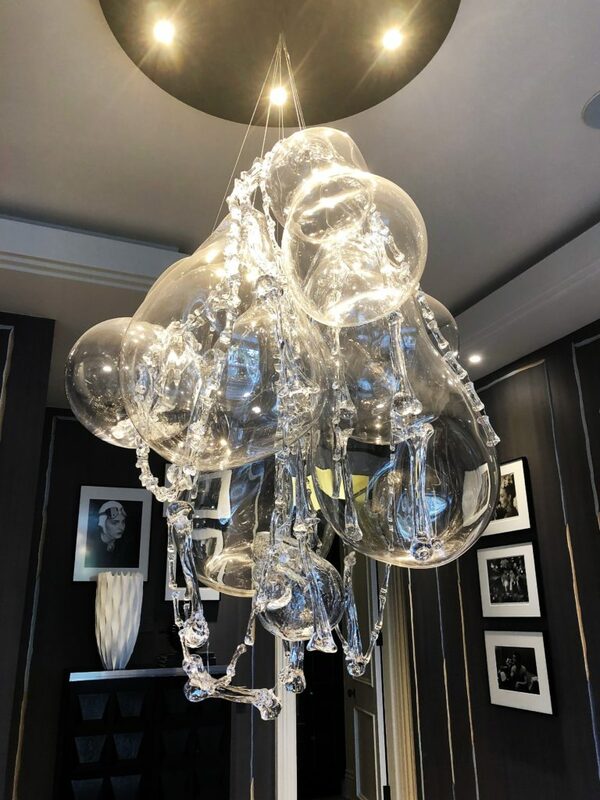 In fact, there was an abundance of artwork within the space, including a collection of Damien Hirst butterfly panels and some exciting sculptural pieces. At the back of this floor, a small salon-esque study had been brought to life by brother-duo Bismut and Bismut for the Invisible collection. Pairing highly textural pieces like ‘The Very Hairy Sofa’ with clean, geometric lines throughout had resulted in a really interesting and layered outcome. This was not too busy nor was it a highly minimalist environment. Instead, the space felt carefully considered; an edited collection of beautiful pieces. Shalini Misra LTD‘s ‘Marooned in Morocco’ did everything it said on the tin. It certainly took me back to my 30th birthday Marrakesh getaway – where a breathtakingly beautiful riad had been our base for several days. Speaking to founder and owner Shalini Misra was both enlightening and inspiring. Her studio advocates rich colours and textures so I felt somewhat sheepish when I shared ‘I’m doing a lot of grey at the moment’. She nodded, knowingly; ‘I find the older generation want something richer – something warmer – for spaces such as their bedrooms. Red tones are always popular’. The maroon bedroom made so much sense; we agreed it denoted romance and passion. 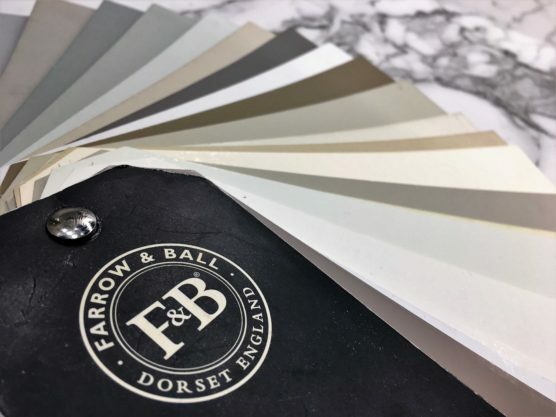 The ideal palette. Shalini had not disappointed here – from the beautiful Fromental wallpaper on the back wall to the plush Dedar fabrics for the upholstery. 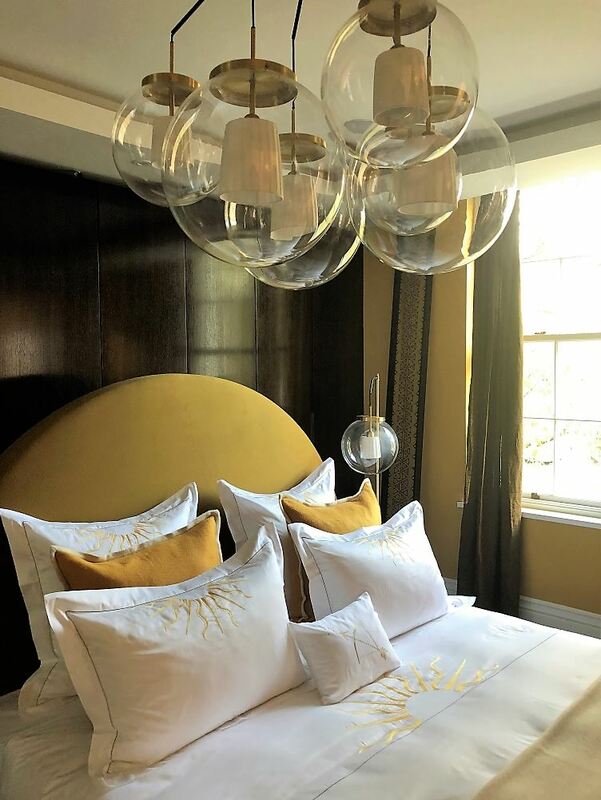 Finished with stunning lighting from CTO – including an impressive chandelier which every bedroom clearly needs – this really was an impressive space. Opposite Shalini’s slice of Morocco was the ‘Sun Room’ – a Palace of Versailles-inspired vibrant space by The Invisible Collection. This was a real highlight for me – not only is Versailles my dream-dwelling but also because ochre with gold is such a winning combo! Framed by the deep stained bespoke joinery, this sunny space was ever-so-slightly smaller and less ‘bling’ than the Hall of Mirrors but by no means less impressive. The first – entitled ‘Teenage Dream” – and certainly something the likes of Katy Perry would adore – was decked-out in all things pink. 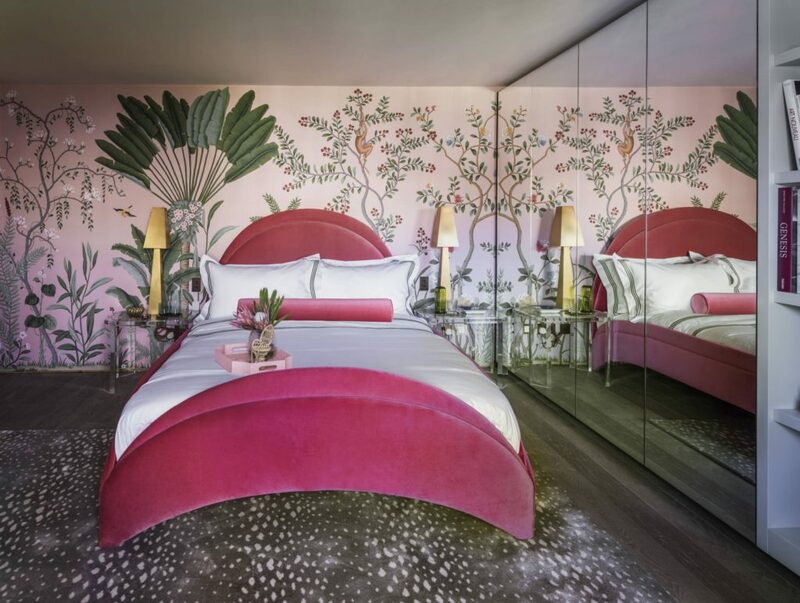 The ultimate teenage girl’s bedroom; with a Sophia Webster designed bed, several pairs of her winged shoes displayed on the open shelving and the wall emblazoned ‘oh la la’ in vibrant neon. Decadent and apologetically fun, this really was a memorable space – the brainchild of designer Simone Suss at Studio Suss. Not only did I enjoy the playful nature of this teenage den -zebra print cushions and all – but I was given a pink-sprinkled cookie as I left. Thanks for the lovely chat and the sweet treats Simone! The guest bedroom by Turner Pocock LTD mixed punchy colour – those zingy yellow accents – with print and pattern. 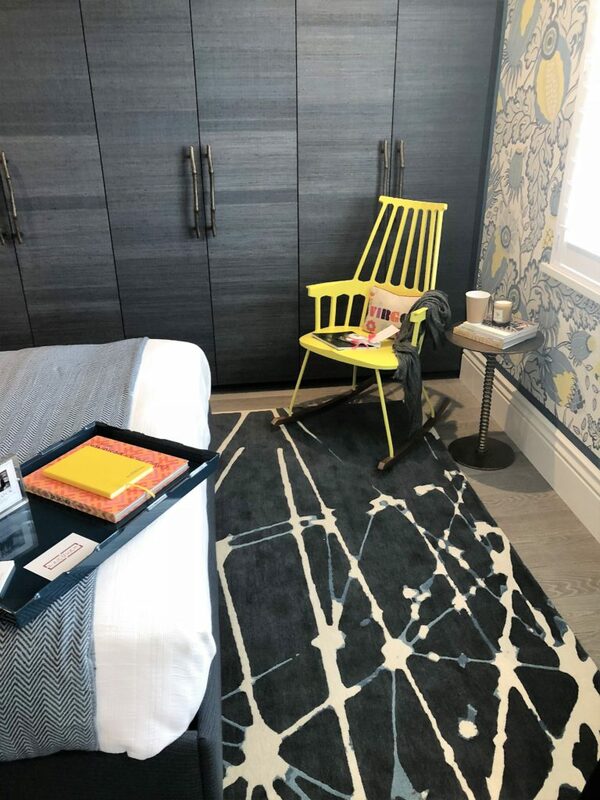 From the Christopher Farr Cloth wallpaper, that had begun its life as a fabric print to the custom-shaped headboard, everything had been devised with acute attention to detail. Reading travel references in many aspects of the design, from the raffia lampshades and woven surfaces to the shutters on the window, this had an eclectic flavour. 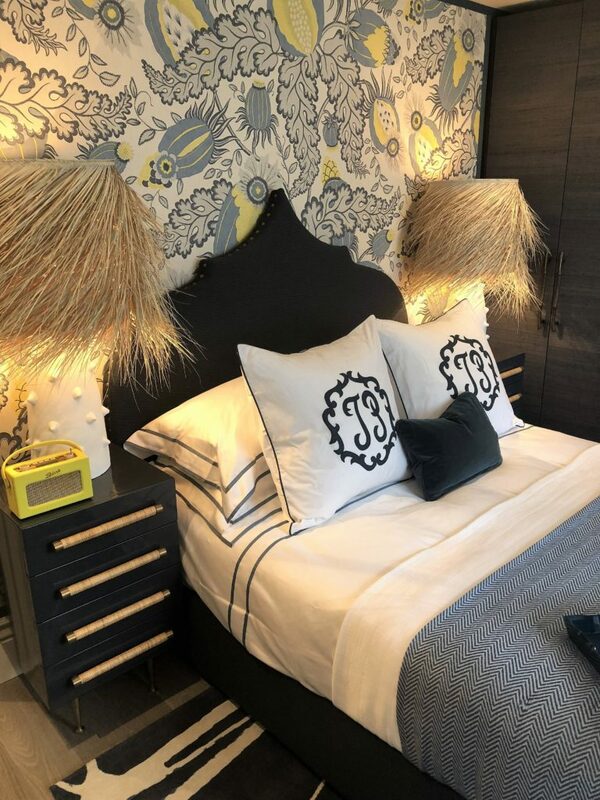 A sort-of Polynesian meets plantation feel, with contemporary elements mixed in this scheme was complemented by a welcomed helping of monogrammed bedding – how deliciously chic. 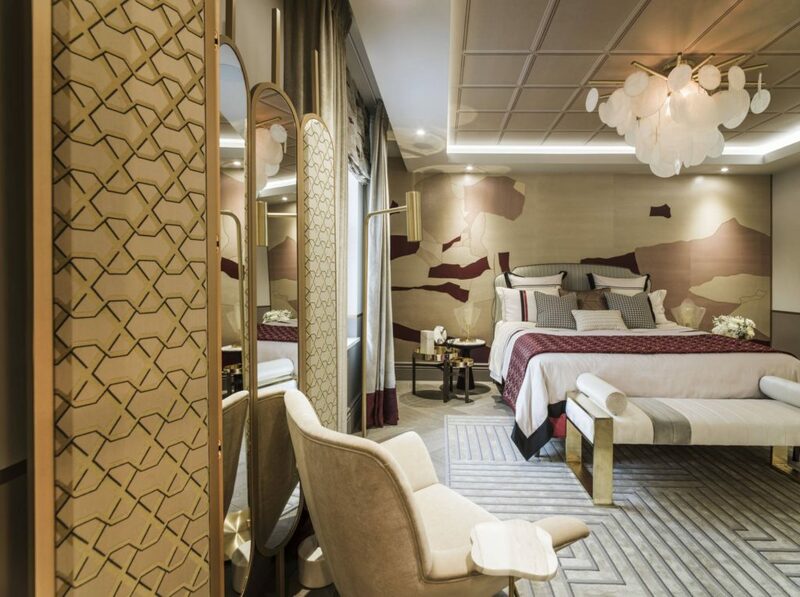 The lovely Amelia of Amelia Carter Interiors had created an luxe and exotic bedroom on the top floor. 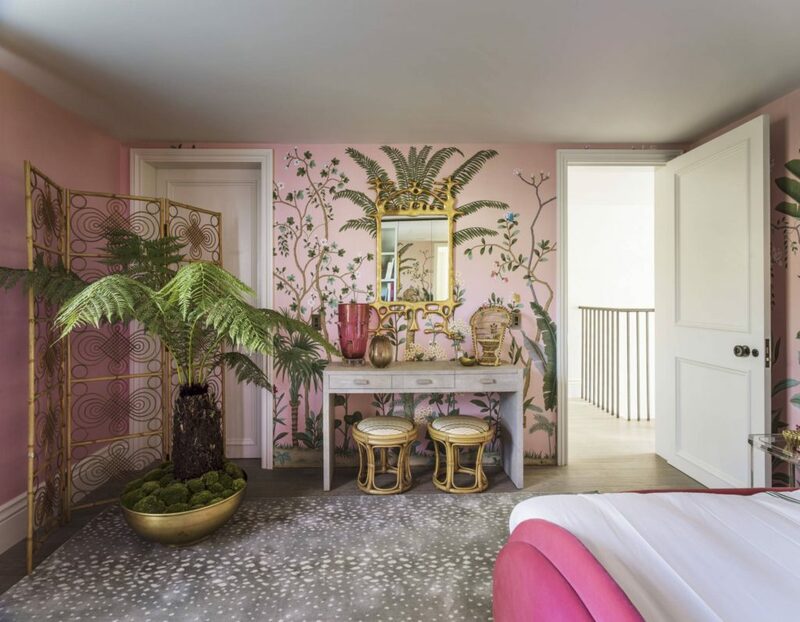 Using mirrored wardrobe doors along one wall to add light and depth to the space and a gorgeous tropical foliage De Gournay wallpaper to frame the curved upholstered headboard, this felt both an indulgent and relaxing environment. (More on enhancing a small space here). I loved all the wicker elements. This was a small nod to a big trend we’re going to see return in 2018. The rich shades of pink and green with elements of gold also got my vote, creating a warm, layered and inviting setting. CW Design‘s ‘The Think Tank’ was a paired-back space dedicated to form. Designer Catherine Weinstock, who I spoke with at some length, shared her passion for art and design and we discussed how every element of the scheme was an exploration in shape and material. From the spherical prints on the wall to the deep-grooved ‘Incontro Table’ by Francesco Perini of Gallery Fumi, this refined edit explored silhouette and process with enthusiasm and a refined sophistication. Catherine talked about how she scours the globe to source unique pieces by talented independent artisans. 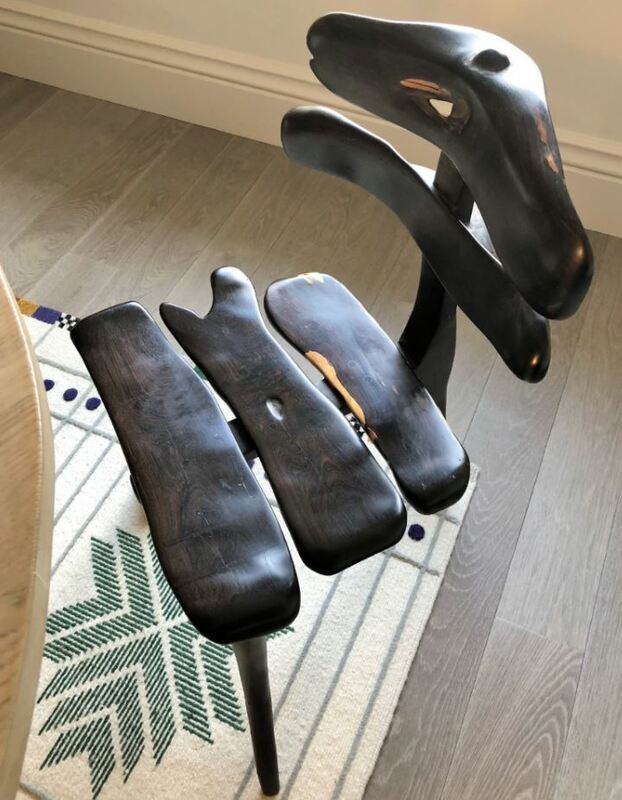 I liked the sturdy, organic form of the ‘Vertebrae Chair’ carved from African hardwood and I appreciated how this was celebrated as a stand-alone piece. Hailed the more traditional of the two show-houses, number 59 required the application of shoe-covers upon entry. This was fine by me; a well-versed ‘shoe-remover’ already, I was all for the preservation of the beautiful flooring within. Oliver Sears Gallery had provided the original artwork for the landing and stairwells of number 59. ‘Running a gallery in a Georgian townhouse has made me appreciate the intricate nature of placing work in exacting spaces’ Oliver had stated. ‘Stairwells, landings, nooks and crannies – we pass these every day, however fleetingly’. Taking the stairs lower ground, I entered a fresh and timeless haven of serenity. 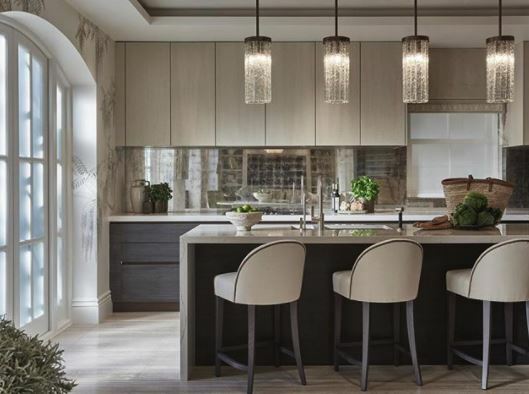 Designed by the ever-chic Sophie of Sophie Paterson Interiors, this was an open-plan kitchen and living space that I had been really excited to experience first-hand, after several teaser Instagram snippets. I’m a longstanding fan of Sophie’s work and my expectations were not disappointed. Taking inspiration from the surrounding greenery, this ‘Garden Oasis’ scheme had successfully brought the outside in. 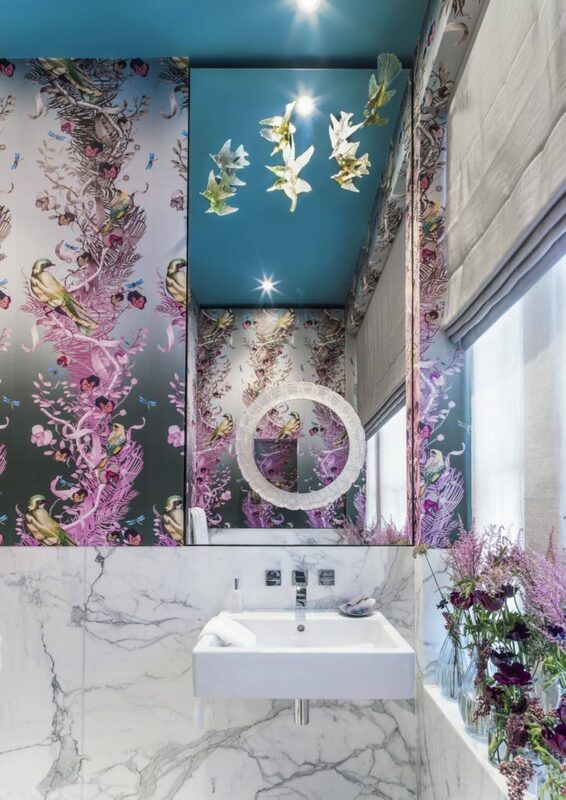 Soothing tranquillity had been achieved through the fresh palette, hand-painted wisteria wall-covering by De Gournay, natural textures and tones. ‘It’s more colourful that our usual schemes’ Sophie told me as we discussed the space. Whilst I was inclined to agree, it still carried an undeniable air of sophistication, synonymous with all SPI designs. The attention to detail in the styling was exquisite; with a sense of balance and harmony across the space. Sophie’s usual modern rustic details were there – from the understated woven fabrics to the potted foliage. And then there was the beautifully studded, white upholstered chair by The Sofa and Chair Company. 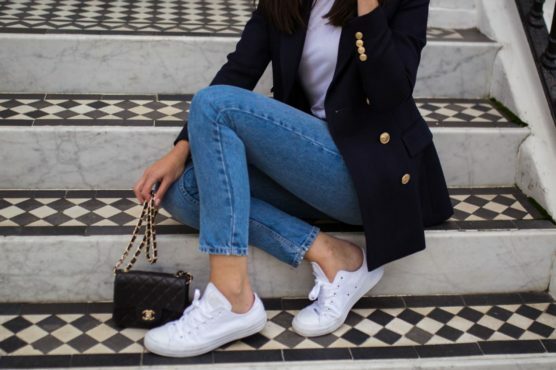 ‘This one’s for looking at rather than sitting on’ we concurred – this was certainly not blue-wash denim friendly! 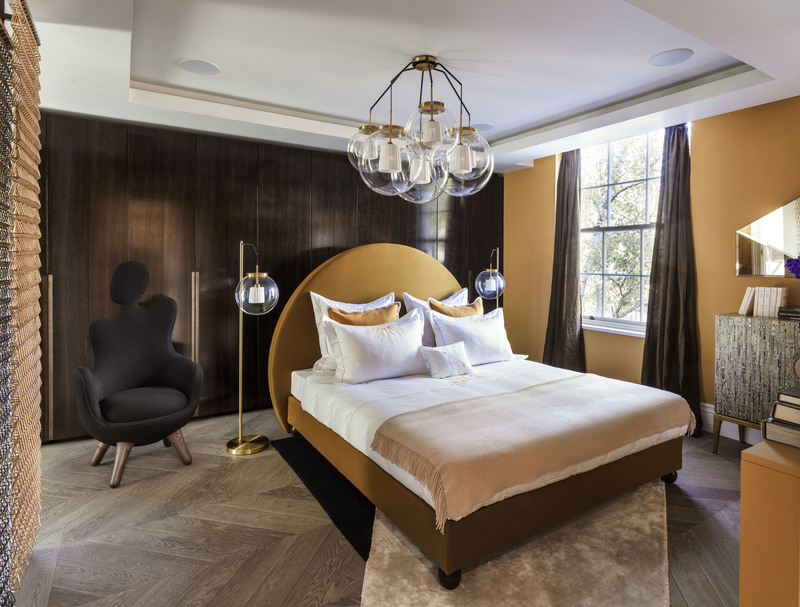 Next door, the sumptuous snug by Natalia Miyar Aterlier x LuxDeco was comfortable and inviting whilst maintaining a glamorous edge. 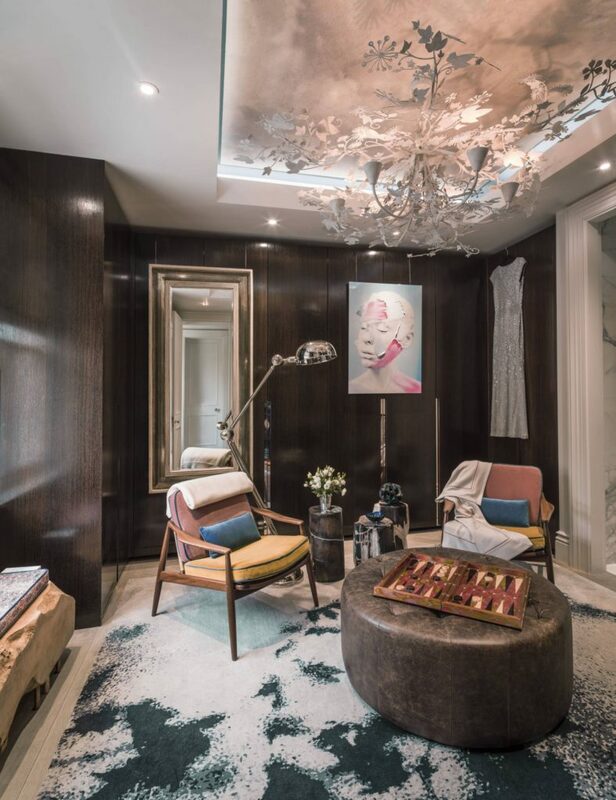 Speaking with both Natalia and LuxDeco founder/ CEO Jonathan Holmes, I understood their desire to create a personal and informal chill-out zone. ‘Somewhere you can relax and watch a film’ we concluded. And why not?! Only a cool several million for the privilege. 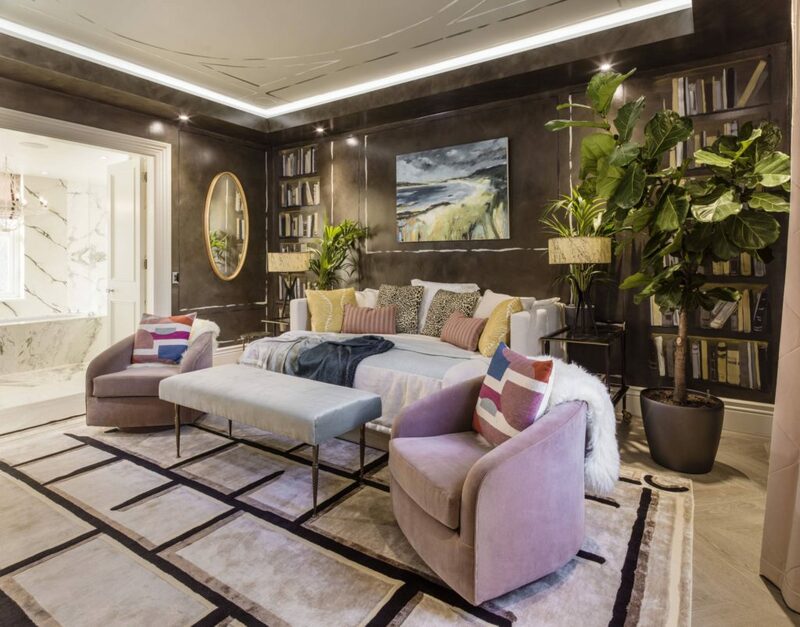 I could see the appeal – large TV, low-level lighting, well-stocked drinks cabinet, gorgeous Pierre Frey upholstery with buttery leather ottomans for feet-resting – and all in a rich, enveloping colour palette. 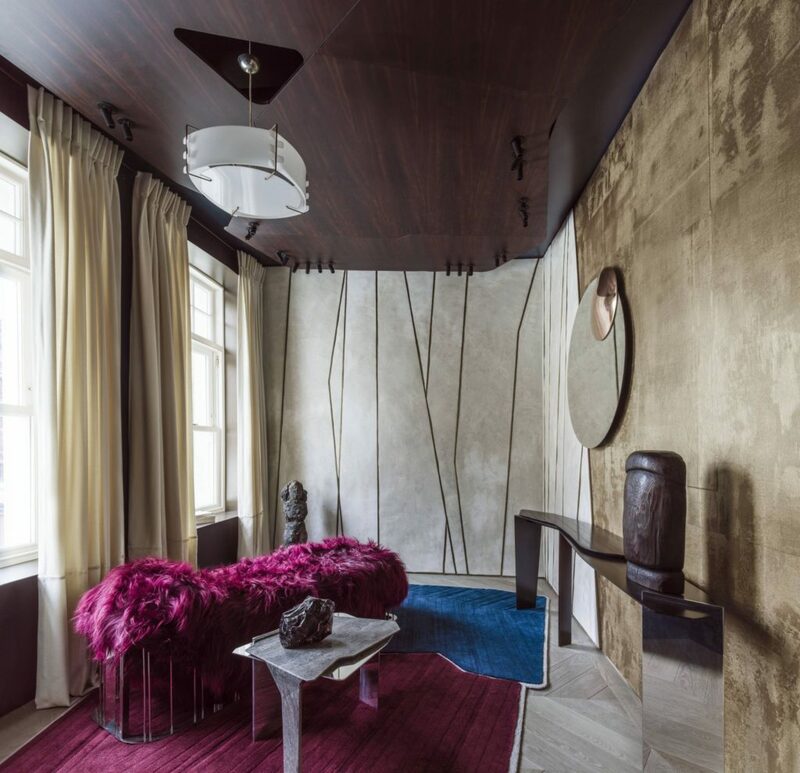 To top this off, the hand-painted textural wall-covering by Fromental was infused with velvet – how fabulously decadent! Designed by Nina Campbell and Justin Van Breda, the formal dining room, at the front of the house was an autumnal treasure. The bay housed two striking Osborne and Little upholstered accent chairs. A playful mix of colour was embraced throughout the scheme – with rusty tones meeting china-blue hues in an exciting interplay. I immediately recognised the Nina Campbell for Osborne and Little ‘Collioure’ wallpaper, inset into the panels of the freestanding walnut cabinet. 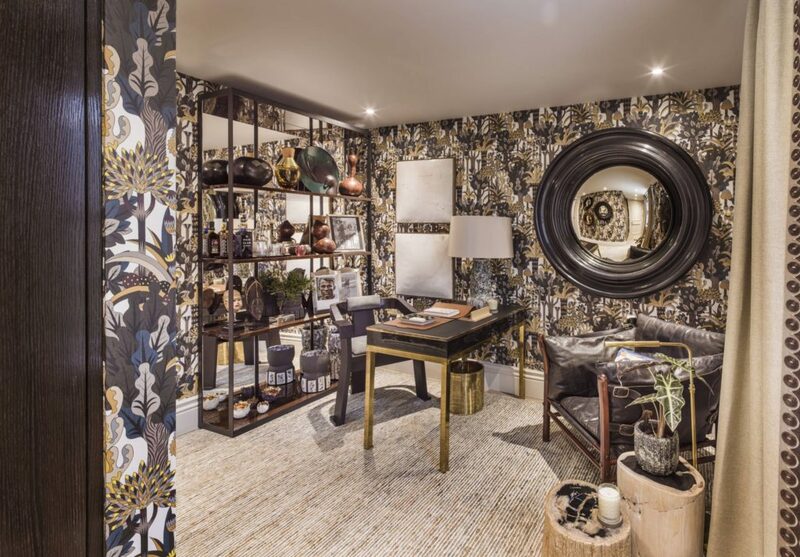 (See it featured in my wallpaper trend report here). The traditional high-gloss lacquered wooden table was styled with quirky touches – scalloped edge shell bowls adorned with stone necklaces. The centrepiece atop the table comprised an energetic burst of textural autumnal leaves in a beautiful cut-glass vase. This somewhat organic focal point was juxtaposed with slick, bauble-style Carlton Davidson pendant lighting above. Taylor Howes‘ impressive living room spanned one side of the house, benefiting from two perfectly balanced fireplaces and duel-aspect windows. 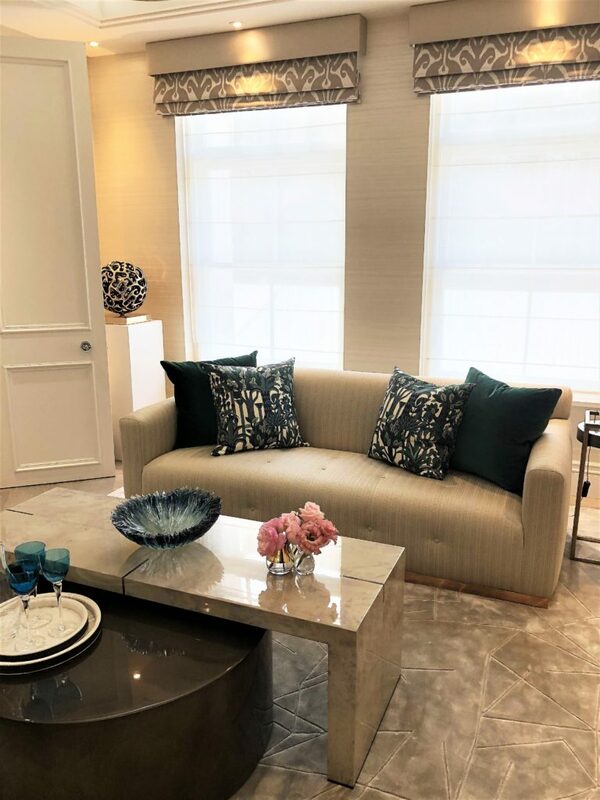 Entitled ‘Home Couture – The Best of The Best’, this was an exceptionally elegant yet interesting space. Of all the elements, I was transfixed by a piece of artwork which changed colour depending on the angle from which it was viewed. Its fair to say that I wasn’t the only person pacing up and down the room, lulled by the changing colours. It also helped to bring the colours of the scheme together. This comprised a neutral base with accents of pink, teal and blue. Brass accents met gloss finishes in a shining example of quality and luxury. Campion Platt (Campion Platt Interiors INC) discussed his ‘Saint Valentine’s Day Secrets’ concept with me. It was focused on layering and depth with fun pops of pink playfully appearing from hidden compartments within the traditional, fine-crafted joinery. The study design celebrated exquisite detailing with the smart panelling extending to the desk and bespoke shelving. Details such as the quirky backgammon set, playful ceiling and punchy artwork really finished the scheme, taking the edge off the formality. Everything had been styled to perfection; from the pink and red accents throughout to the purple hue of the jacket, nonchalantly placed over the desk chair, which was echoed in the framed prints and spine of a book. 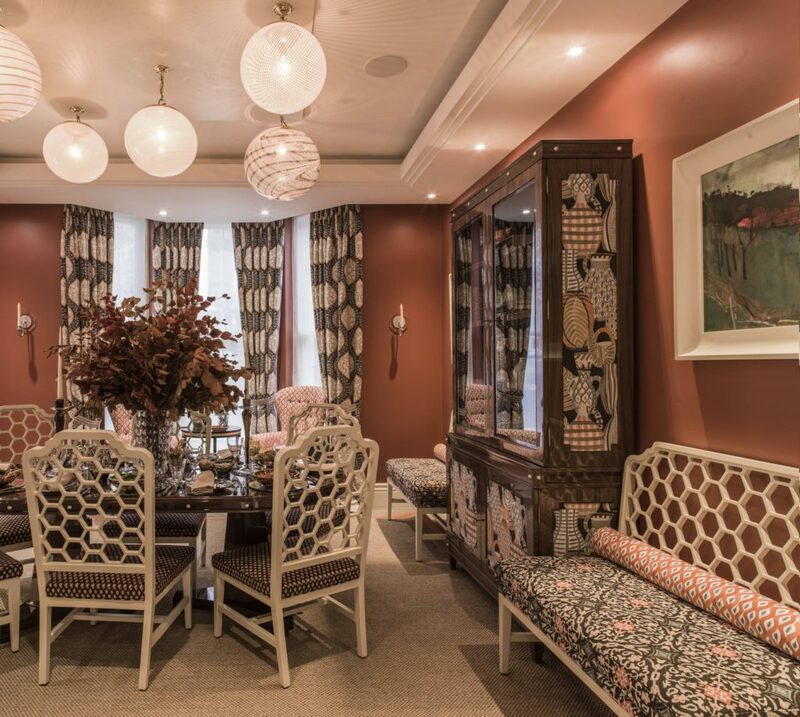 The lovely Hazel of Hazel Collins Design had a mix of spaces to contend with across house 59, Hamilton Terrace. 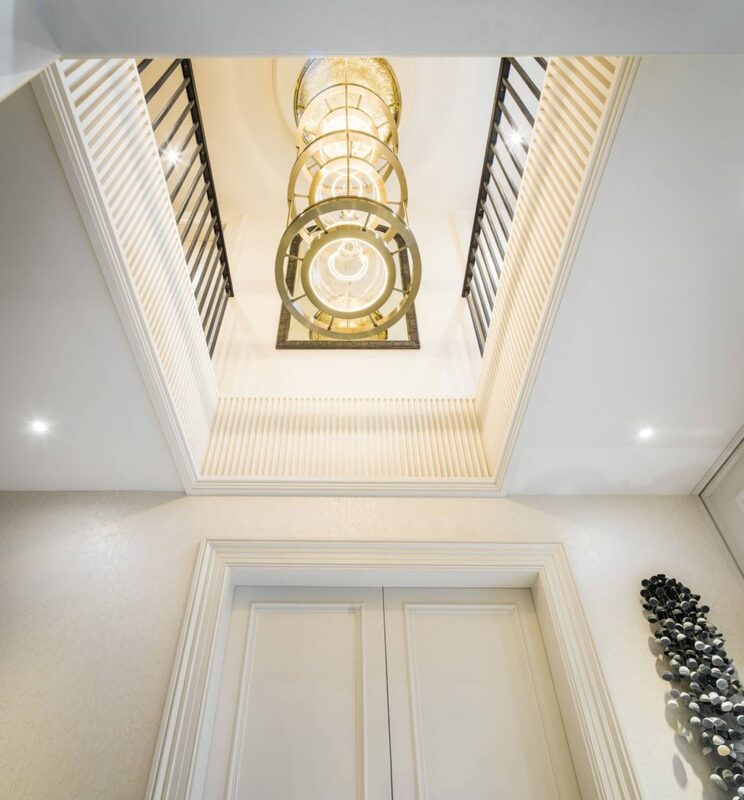 In addition to the seemingly endless staircase – the spine of this impressive build – she also designed the beautiful hallway, landings and the ground floor cupboard bar. Working with such tight spaces did not seem to phase Hazel, who had handled each area with grace and finesse. Complementing the structural surrounds with curves and organic shapes, the overall look and feel achieved was calming and exquisitely beautiful. 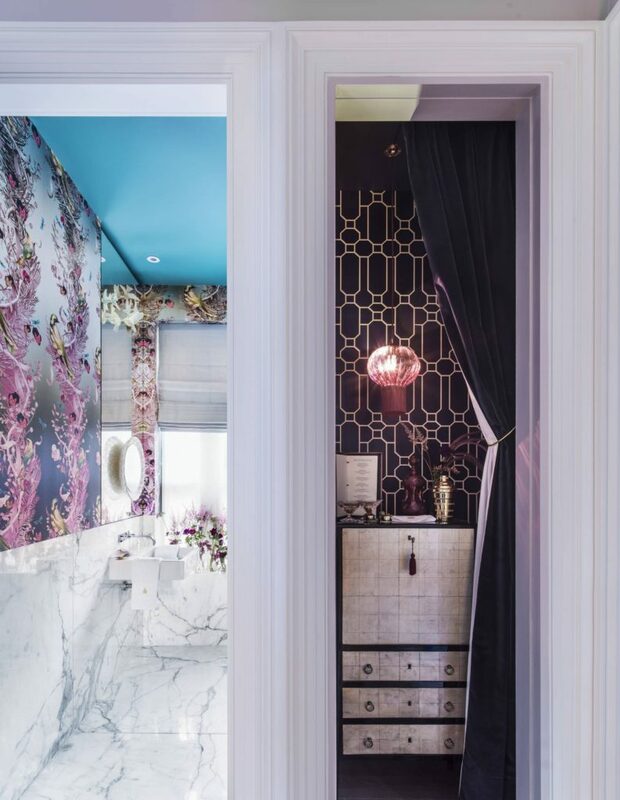 The guest WC was given a truly glamorous feel, with flamboyant Kit Miles wallpaper installed above the marble tiles and the ceiling painted teal to extravagant effect. Pretty purple blooms lined the window sill – shades of lavender, heather and plum mixed – and drama achieved. A charming space, Studio QD LTD and Nicky Haslam‘s ‘Nocturne in Grey and Silver’ is another triumph for the trio of designers. Mixing colours, textures and referencing a number of design styles to great effect, this master bedroom is a celebration of eclecticism. Presented more as a social hub – think Gatsby’s mansion – than as a secluded intimate space, it boasts ample seating and a martini side table to amp up the glamour. 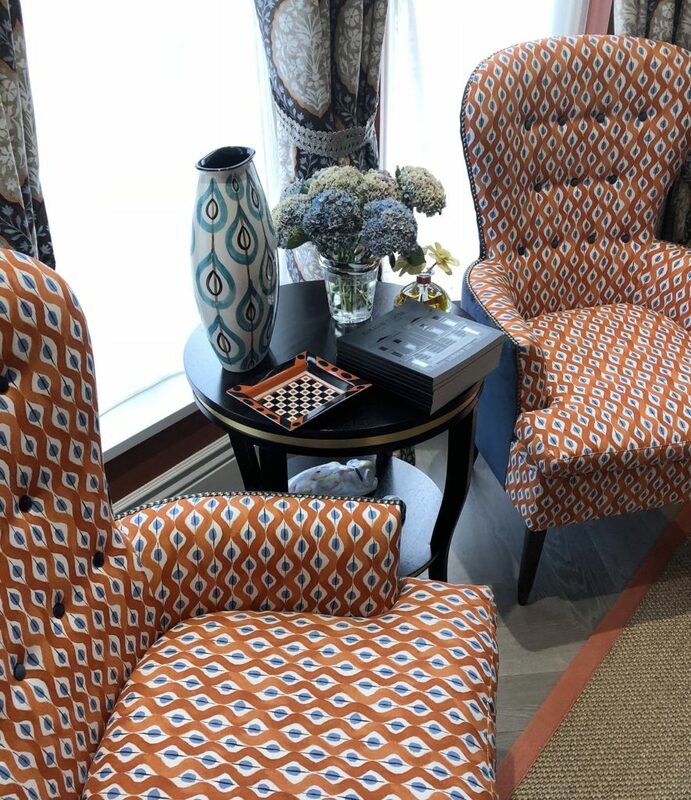 Beth Clancy originally worked as a textile designer for the fashion industry and this really translates in her fabulous dressing room. Mixing stand-out artwork – from contemporary painting to glazed ceramic pieces – with highly textural furniture (love the Andrew Martin petrified log side tables), Beth’s enthusiasm for surface and form is celebrated. Image source: Mel Yates. Who doesn’t dream of a purpose built dressing room with ample shoe-space and a bar-cart?! The dark stained joinery worked in beautiful contrast to the punchy accents of colour and texture. The bar cart – set to be the must-have interiors item for 2018 – was a fun addition to the scheme. Who doesn’t love a cheeky gin before a night on the town? – I say this like I go out regularly which isn’t further from the truth! 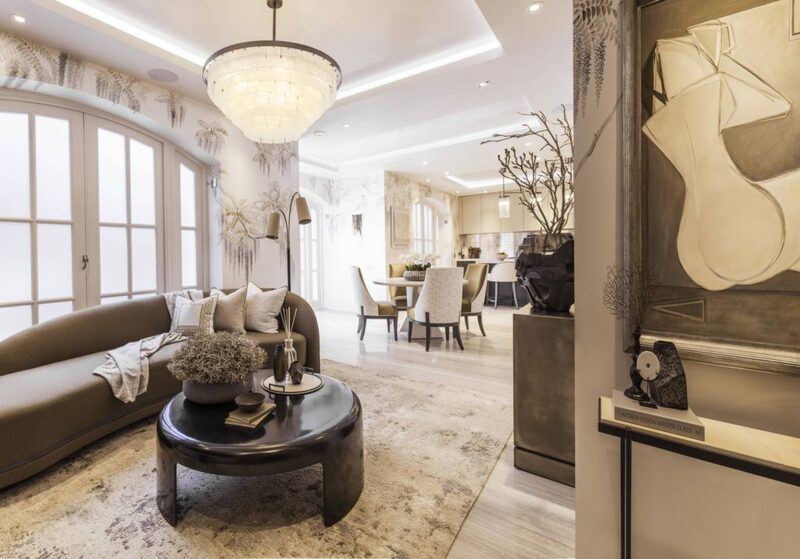 Laura Hammett‘s London-based design studio produces immaculate schemes time and time again and are known for their attention to detail. I had first seen the drawings for this ‘Aegean Luxury Retreat’ at Decorex 2017 so I was really excited to finally experience the vision first-hand. A little more ‘themed’ than Laura’s usual designs, it was even more beautiful and tranquil than I could have imagined. The palette of soft blues and warm greys offered an air of serenity from the outset. With a gentle blend of quality textures and finishes perfectly balanced, no vista in this small space had been overlooked. 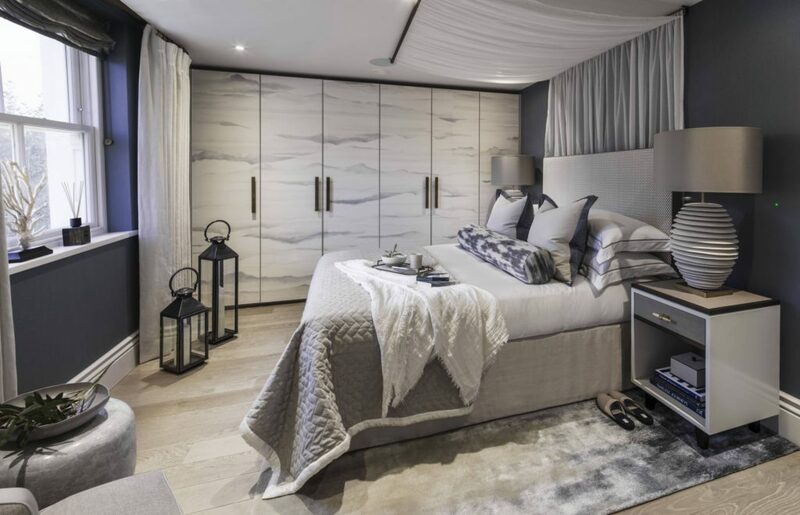 Laura and I discussed the subtle Greek and marine references throughout the scheme – from the natural undulation in the bedside lamps to the subtle scalloped fabric used for the headboard upholstery. 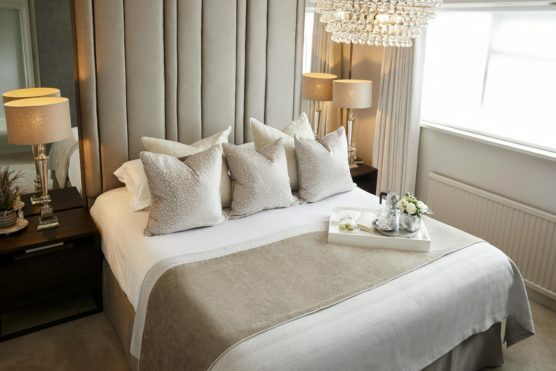 Softened by delicate drapery, the bed was layered and dressed to perfection. 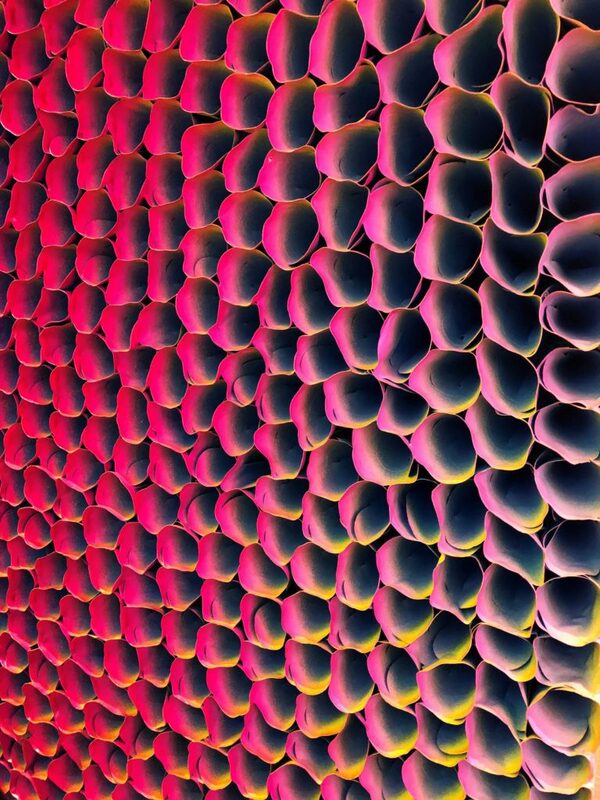 I marvelled over the porcelain relief artwork by Valeria Nascimento. 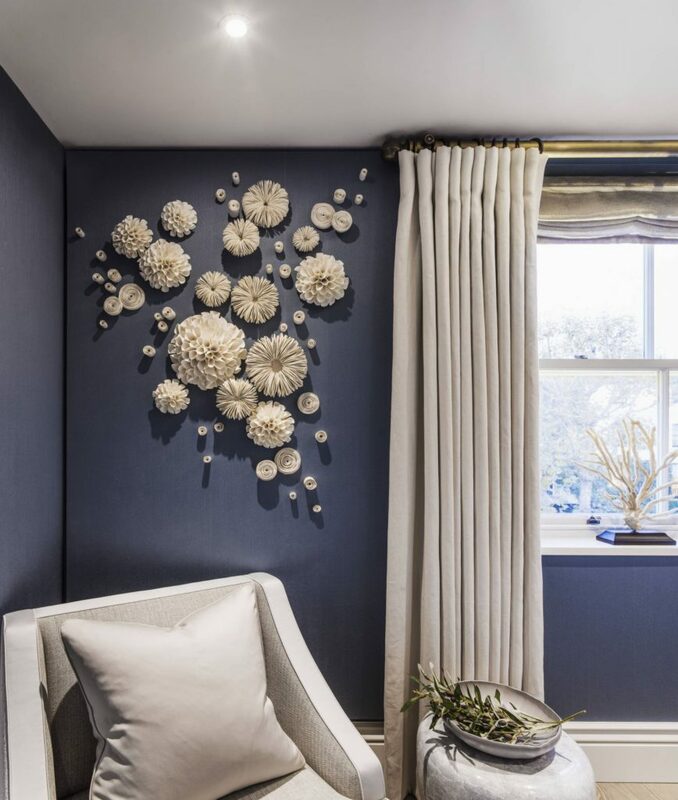 So beautifully delicate and fragile, this collection of natural forms made a real statement set against the strong blue backdrop of the bedroom wall. 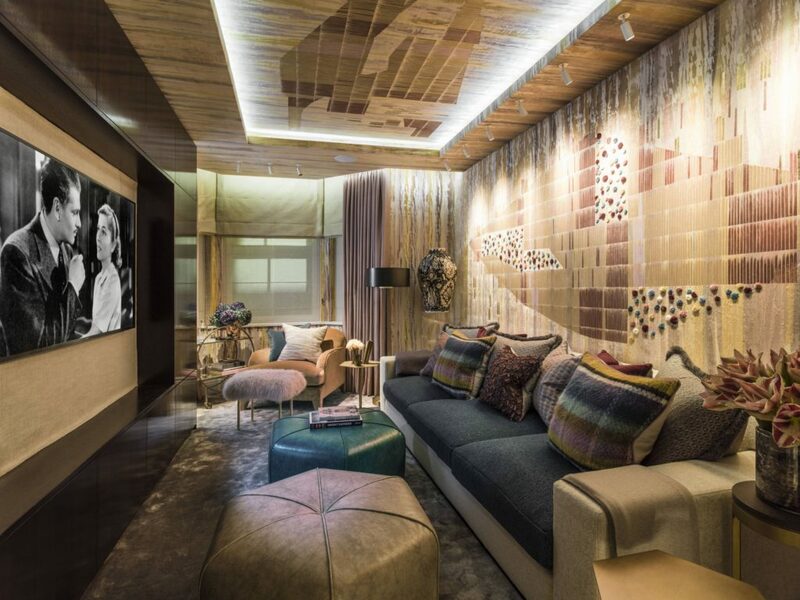 I enjoyed my chat with Patrik of Patrik Lonn Design in his ‘Out of Africa: An Equestrian Journey’ den. Being an enthusiast of early 20th century art and design myself, this really was a space I appreciated both for its drama and its subtleties. The African masks and indigenous references created a Picasso-meets-Gauguin flavour, whilst other elements within the scheme shouted ‘modern luxury’. This was the perfect hybrid and was a space like no other within the two houses. ‘You’re playing music from Gladiator’, I mused, delighted with my recognition of the haunting soundtrack. ‘Yes – the music is meant to be calming’ said Patrik, who had clearly devised a scheme to offer rest-bite from the hustle and bustle of our city/suburban lives. I loved all the contemporary desk accents by L’Objet (see more of their studded pieces here), alongside the more historical pieces by Bentley’s Antiques. This was a cultural treasure trove! I’m going to let you into a little secret; I love a stripe! Roselind of Roselind Wilson Design clearly does too. Her ‘Striped Night’ scheme embraces the look with gusto and I applaud her bravery. 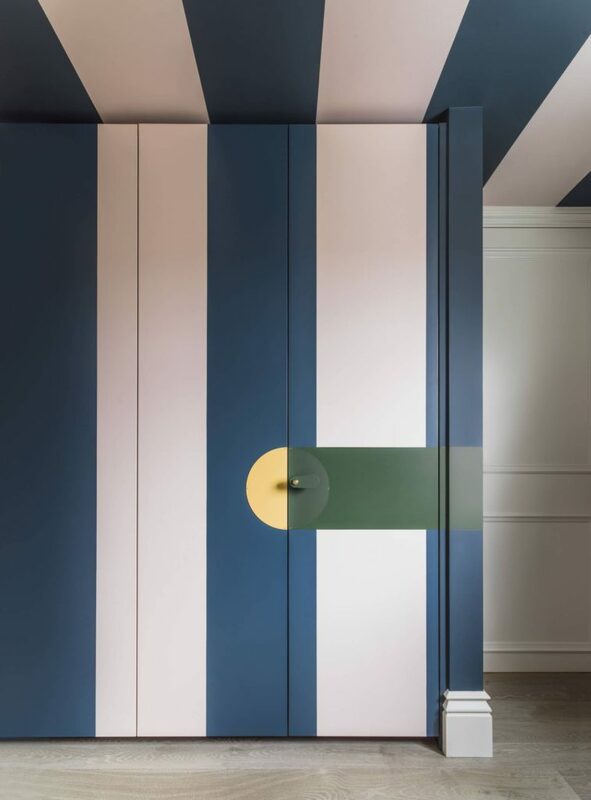 Not confined to the walls, her broad striped scheme extended to the ceiling and the joinery, elevating the space and adding drama. Elsewhere, more subtle print and pattern was used – the support act. More often than not, small spare bedrooms are a little unloved…Not this bedroom. The colour clash of blue and green worked perfectly against the coral footstools whilst the mix of old and new gave the space a charmed feel. Scandi-style but not as we know it; Meredith Ostrom Studio‘s ‘Viking Rock Princess Room’ really was an unexpected corner of the house. 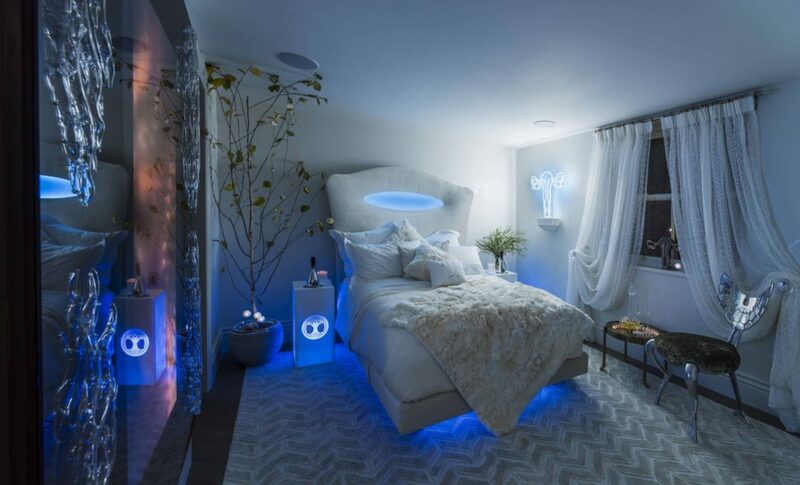 A fusion of paired back Scandinavian living with futuristic lighting and technology, this space created quite the atmosphere. Set against a white backdrop across part of the scheme, art is displayed for both aesthetic and functional purposes. Chills are kept at bay with the introduction of warm textures. From the fur throw and upholstered chair to the casually layered cushions, richness and depth is added to the blue-lit space. 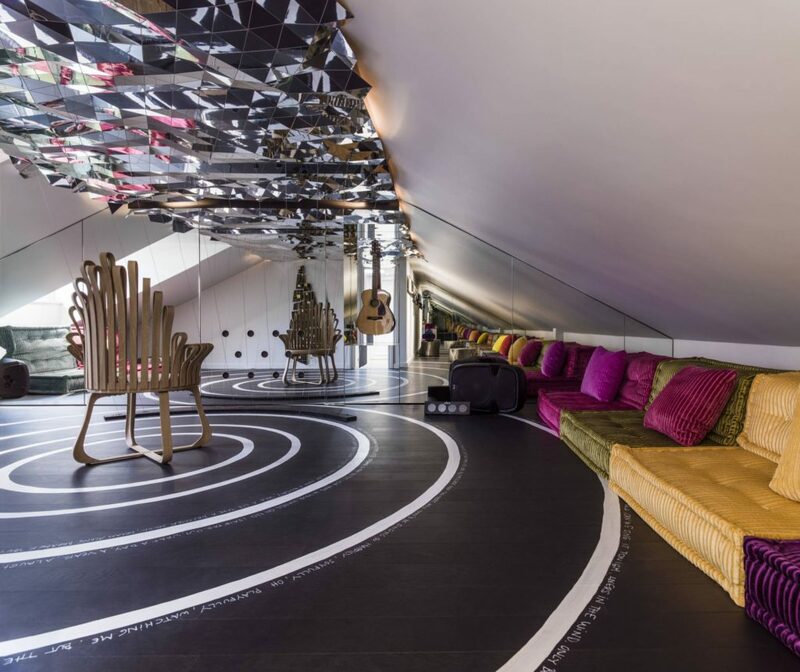 Occupying the large loft, the ‘Dreamers Lounge’ by Maidenberg Architecture & Roche Bobois is a poetic space ‘for the legendary musician Roger Hodgson, co-founder of Supertramp’. Pairing Roche Bobois’ iconic Mah Jong sofas – the ultimate solution for low-level loft living – with some shapely stand-alone accents, this scheme celebrates new technology, art and music. I found it to have a mid-century modern meets postmodern attitude; playful and forward thinking with remnants of nostalgia at the very heart of the design. It was the perfect final act. I left the houses feeling inspired, excited and totally uplifted. I also felt sheer admiration. Admiration for the persistence and determination of Iris Danker and her vision. For the hard work and commitment that all designers had dedicated to this wonderful initiative. If you’ve read this far then well done you! It’s been a monster-post! In truth, it was never meant to exceed 4000 words. It was supposed to be a snapshot. When it came down to it, I just couldn’t leave anyone out – it was all so fantastic! But please don’t take my word for it. Go and pay Holiday House a visit yourself. Experience those breath-taking spaces first hand. Marvel in the grandeur and quality – that exquisite level of craftsmanship that we don’t all get to experience on a daily basis. You won’t regret it. Girl signing off (and pouring a well-earned glass of wine)! Love everything about this and nust get myself there !!!!! X those chairs in the first photo Omg! 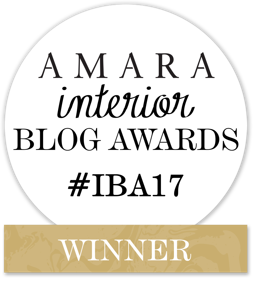 Really helpful blog for Luxury Interior Design especially London based designed studio both for commercial and residential spaces. Nice blog for interior design and if you want company secretary services then follow the next blog.